we have finally found our favorite b’ham restaurant. it sure did take a while. the archer ale house is an english style pub house, in the basement of an old fairhaven building. the food reminds us of one of our nashville favorites: the flying saucer. tom loves their pizza, i’m a huge fan of their pot pie. it is very spicy and just warms you all of the way through! they make it to order and it is well worth the wait. but pot pie shouldn’t just be saved for when you go out. it is easy to throw together and even anti-pot-pie tom loves it. i used frozen thanksgiving turkey leftovers, but feel free to use any chicken or turkey that you may have on hand. chunked, shredded, whatever you prefer. just try this pie. do it. now! prep your pie crust. 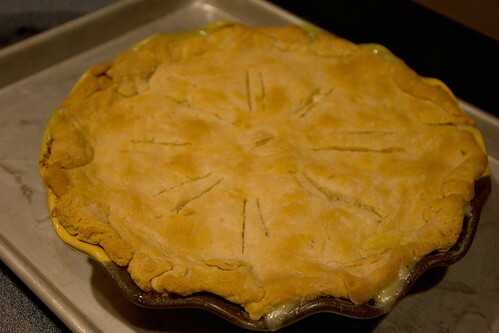 you can use a store bought one, but this pie crust is pretty simple to throw together. 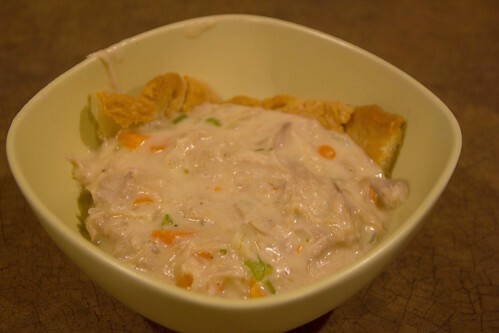 cut the flour, crisco and butter together, using a pastry cutter, until it resembles a coarse meal. in a small bowl, whisk your egg, dump half out, and then add water, white vinegar and salt. add to the flour mixture and stir until combined. form the dough into a ball. wrap in saran wrap, pat out into a disc and place in the freezer until you’re ready for it. 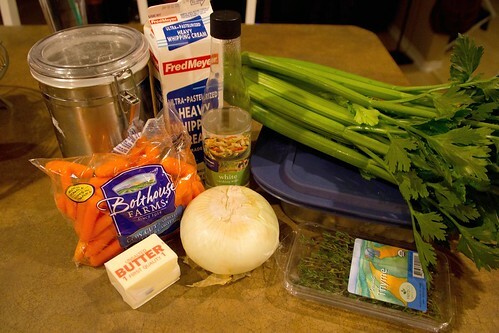 melt butter in a dutch oven, add onions, carrots and celery and cook until translucent. note: i picked up a new spatula in vancouver and LOVE it. 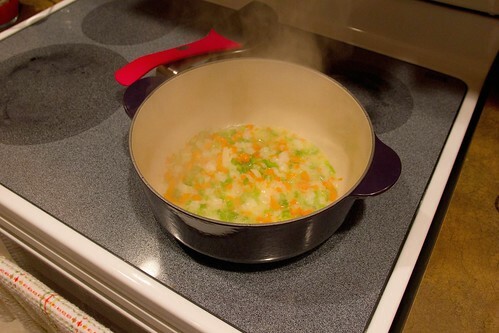 it doesn’t get all separated on the end and works well with my non-stick pans and dutch oven. add turkey and stir. sprinkle flour over turkey/veggie mixture and stir to combine. cook over medium heat and continue to stir constantly. pour in the chicken broth and then splash in the vino. pour in cream. 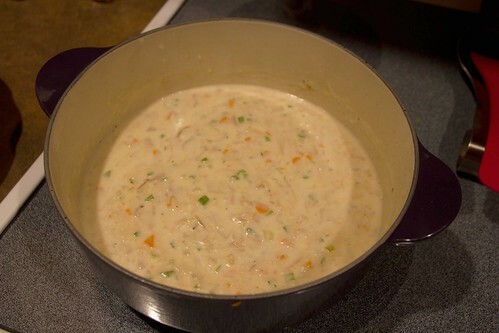 bring to a slow boil and let the mixture cook and thicken for a few minutes. add thyme, paprika, cayenne pepper, salt and pepper to taste. don’t be too shy. taste it, to make sure it’s right and set it aside. remove crust from freezer (you’re ready now). un-wrap the dough and leave on the saran wrap, dust the top with flour. roll out crust onto the saran wrap, working from the center out. roll out to the size of your dish. pour pie mixture into your baking dish. 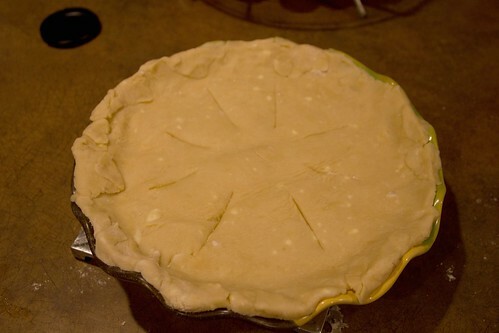 flip pie crust on dish, saran wrap side up, and remove the saran wrap. (wasn’t that easy?) cut vents in the pie crust. see the chunks of butter in the crust? they make things nice and flaky. place on a pan, to catch any extra drippings and bake for 30 minutes, or until golden and bubbly. Looks delish. Very similar to what Dad made this weekend! Comfort food!! Very similar indeed. Comfort food is always awesome.